Your sword is a beautiful and formidable weapon that has stood by you through many a trial. When not in use, it deserves more than being tucked away in your closet. Put your sword on display for all to see with the One Tier Sword Stand. This wooden stand is perfect for the placement of a katana or medieval blade. The arms that hold the sword are lined with red felt, ensuring that your blade will be cradled with the respect it deserves. The wooden sword stand displays a beautiful cherry-colored finish, ensuring that its beauty will complement the elegance of your weapon. The One Tier Sword Stand is the perfect piece of decor for any sword-enthusiasts home. 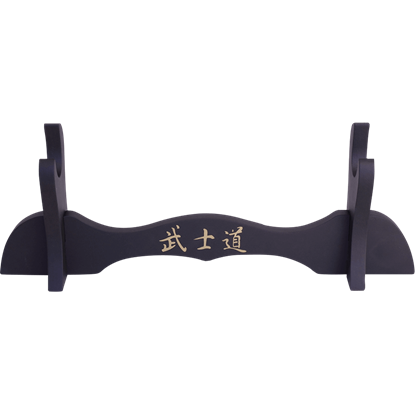 Our exquisite Japanese Sword Stands are perfect for displaying your Oriental or katana sword sets. 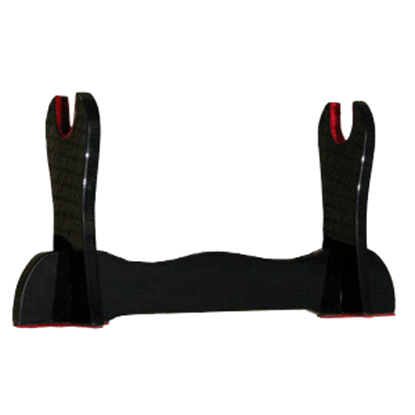 The Single Sword and the Double Sword Stand are black lacquered and feature a padded shelf for a Tanto or maintenance kit. This beautifully ornate desk stand can hold one Japanese style sword. 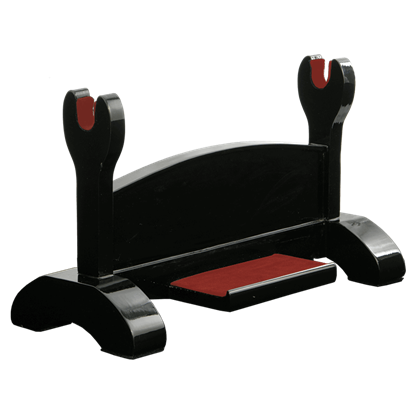 The one sword desk top stand is made in Spain and has a black lacquer finish. 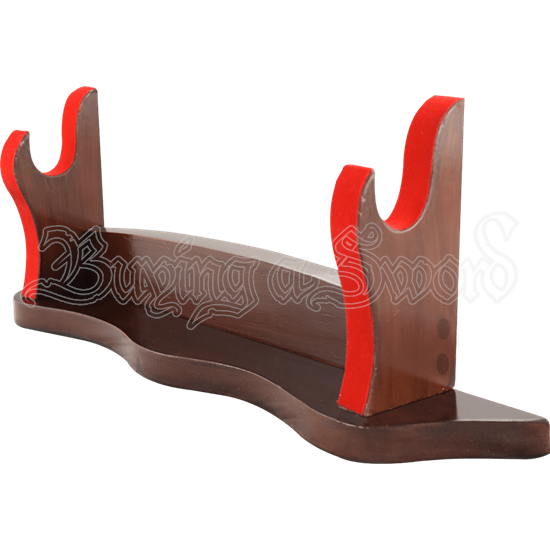 The one sword desk top stand is made of sturdy construction. The Premium Single Sword Stand serves as an impressive accessory for showing off your favorite blades. 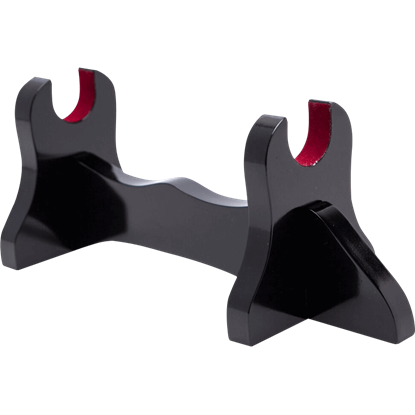 This weapon stand will accent your katana or other sword with its high gloss piano black finish, creating a stunning display. Weapons collectors looking for an easy way to show off their favorite blades can now do so with the help of this sword display stand. The Musashi Single Sword Stand makes the perfect solution for showcasing an oriental sword. The Matte Black Single Sword Stand serves as an impressive accessory for showing off your favorite blades. 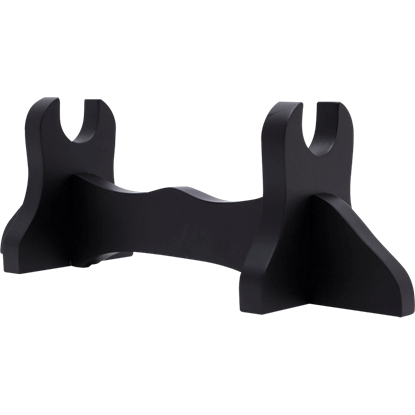 This weapon stand will accent your katana or other sword with its smooth matte black finish, creating a stunning display.